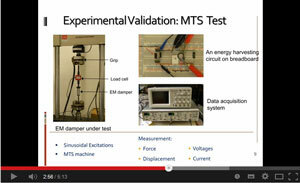 Back in October, we challenged authors of the 2012 top-25 downloaded papers in Engineering to submit an AudioSlides presentation to accompany their published article. The new AudioSlides functionality enables authors to explain their research article in a personal and easily accessible way. "Our authors are very positive about AudioSlides. It gives them the opportunity to explain why their paper is important and attract interest in their work by including the presentation on their homepage or upload it to YouTube", commented Hylke Koers, Content Innovation Manager at Elsevier. AudioSlides presentations are freely available on ScienceDirect so that they can be viewed by all whether or not the user has a subscription to the journal. After extending the original deadline to accommodate late entries, we were overwhelmed to receive a total of 67 presentations by the 31st October deadline. Even more overwhelming, between 1st and 30th November, the YouTube channel where the AudioSlides are hosted received over 7,000 views. The AudioSlides presentations from this competition are all hosted on a dedicated YouTube channel, where they can still be viewed. They also appear next to the relevant article on ScienceDirect, and on selected journal homepages. Find out more about the Engineering AudioSlides Challenge. Learn how to submit an AudioSlides Presentation with your article.